Not a Mono. Not a Braid. The Next Generation of Fishing line. 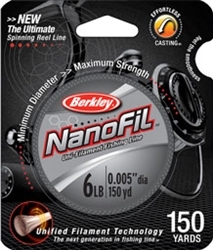 NanoFil is made out of gel-spun polyethylene, much like a superline. * Our longest casting line! Anglers will experience exceptional casting distance and accuracy allowing them to cover more water and Catch More Fish! * Zero stretch means superb sensitivity. Now you can feel everything from the lightest pickups to the jarring strikes. * With an incredibly high strength/diameter ratio, this is the thinnest Berkley line yet meaning you can go lighter than ever before. * Zero memory virtually eliminates line tangles, which means you spend less time untangling lines and more time fishing.